Texas, Kentucky, Mississippi, South Dakota, Louisiana, and Alabama include 66 of the nation’s 100 poorest counties. – One in four rural children live in poverty, and of the 50 U.S. counties with the highest child-poverty rates, 48 are rural. – Mental health issues complicate the process further. Individuals between 10 and 24 years of age living in rural areas are twice as likely to kill themselves as their urban peers. – Drug usage abounds. In the mid-2000s, rural 8th graders were 59 percent more likely than their urban peers to use methamphetamines and 104 percent more likely to use any amphetamine. Changes to public funding schemes, policies, and economic incentives could encourage more initiatives that match educational opportunity to rural economic vitality. – Local Innovation: Online adaptive learning delivered directly to schools and students, the development of fresh, locally relevant school models, and efforts to improve the quality of instruction and regulation benefit rural schools immensely. – Improving Rural School Choice: Chartering could be a tactic to liberate schools from meaningless or detrimental state regulation. The autonomy that charter laws afford could be put to good use in rural schools, which labor under rules often designed for their urban cousins. – Increasing College Access:21 percent of 25- to 34-year-olds in rural communities hold a bachelor’s degree or higher, compared with 13 percent of those 65 and older. An education system custom-made for rural communities would ensure that those who wish to stay in their community have access to relevant career education while they are in high school. Students should also be exposed to rural entrepreneurialism and encouraged to create new ventures in their communities. 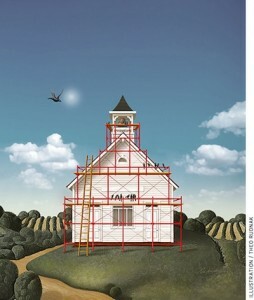 An education system that is lackluster in urban America is perhaps even more so in rural areas. This need not continue to be the case. Political and education leaders should focus on creating the policy conditions and more fully integrating the industry opportunities that can best address rural education improvement.